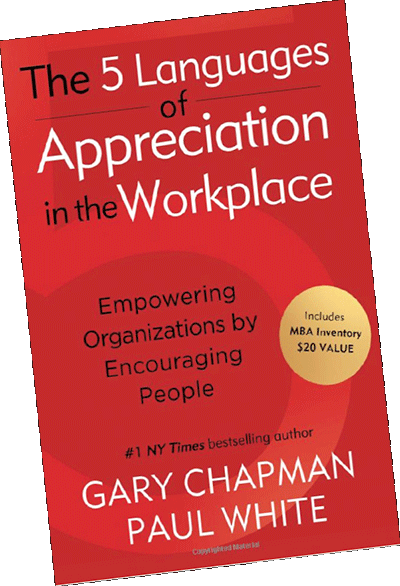 You may use the FREE code (not yet used) provided in your 5 Languages of Appreciation Workplace book to take the assessment. The inventory takes 15-20 minutes to complete online and an individual report is generated immediately which identifies the respondent’s primary, secondary, and least valued language of appreciation. Upgrade your code to take a specific work setting version of the MBA Inventory. The code from the book applies to most general work settings, but we have created customized versions for a variety of workplaces to make the results more applicable and practical to settings with unique challenges. Build credibility by having practical items which take into account the limitations of the characteristics and rules of your workplace. The government version is constructed specifically for those who work in government settings, whether Federal, state, county, municipal or other government-related offices. The medical version of the MBA Inventory is designed specifically for those who work in medical settings including medical practices, hospitals, outpatient clinics and specialty treatment centers. The ministry/not-for-profits version of the MBA Inventory is designed for those relationships where individuals work (either as staff or volunteers) in ministry, church and non-profit settings. The military version of the MBA Inventory has been created to be utilized by any branch of the military (including active duty, reserves, and National Guard). The school version of the MBA Inventory is designed for administrators, faculty and staff who work in school settings (public or private) ranging from preschool to high school. At Appreciation at WorkTM, our goal is to provide practical resources to “make work relationships work”.